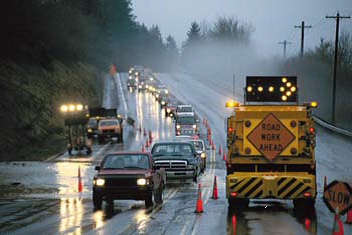 As road construction projects ramp up this spring, the Federal Highway Administration is partnering with OSHA, the American Traffic Safety Services Association, and other groups to encourage safe driving in work zones. The campaign, called National Work Zone Awareness Week, is an annual event set for April 3-7 this year. Tragically, 700 people, including 130 workers, were killed in crashes at roadway worksites in 2015. Many states and localities across the country will hold events to bring attention to these hazards and encourage safe driving around work zones. A national kick-off event is planned for April 4, at 10:30 a.m., at the Maryland state Randolph Road/Georgia Avenue Interchange Project. In addition, the Georgia Struck-By Alliance, which includes OSHA, will hold stand-downs at highway construction locations throughout Georgia this week to train workers on the dangers of distracted drivers and flying debris. For more information on the Georgia events, see the news release. Honeywell Flourine Products in Claymont, Del., has earned OSHA's Voluntary Protection Programs' Star designation for exemplary commitment to workplace safety and health. In VPP, management, labor, and OSHA work cooperatively to prevent fatalities, injuries and illnesses through the establishment of a safety and health program. Honeywell initiated several programs to reduce or eliminate workplace hazards, such as involving contractors in all processes, trainings, and safety decisions on the site. As a result, the injury and illness rate at this worksite is now less than 1 percent, which is significantly low for a facility that processes numerous hazardous chemicals. VPP participants achieve Star recognition when they maintain injury and illness rates at or below the national average of their respective industries. OSHA Regional Administrator Richard Mendelson recently presented management and employees with a VPP plaque and flag. Visit OSHA's website to learn more about VPP. Industrial machinery manufacturer Innovance Inc. contacted OSHA’s free On-site Consultation Program for help establishing an effective safety and health program at the company's three plants in Minnesota. One of the first steps was creating a safety committee, composed of employees from all levels of the company and management representatives. The committee makes sure employees feel comfortable reporting hazards and making safety suggestions. The company also provided annual hazard recognition training and established a monthly inspection program that includes employee participation. Innovance invited the local fire department and an insurance company to evaluate the facility. As a result of its efforts, Innovance has earned Safety and Health Achievement Recognition Program status at each of its three locations. SHARP recognizes small business employers who have used the OSHA On-site Consultation Program and operate an exemplary safety and health program. See the success story for more information. OSHA, Georgia Tech's Occupational Safety and Health Program Office and Barton Marlow, a construction company in Alpharetta, Ga., signed a strategic partnership to protect the safety and health of workers during the construction of Denmark High School in Alpharetta. The partnership will promote increased training, weekly safety meetings, safety and health programs, and safety orientations designed to increase workers’ knowledge of hazards and safety procedures in construction. The International Union of Operating Engineers, Local 150 Apprenticeship and Skill Improvement Program has renewed a five-year agreement to train and protect Illinois heavy- equipment operators. For more information, see the news release. The Associated Builders and Contractors Inc., Heart of America Chapter has renewed a two-year agreement to address struck-by, fall, caught-in-between and electrical hazards in the construction industry. For more information, see the news release. El Sol Jupiter's Neighborhood Resource Center has renewed a five-year agreement to provide construction workers with workplace safety information, guidance, and access to training resources. Constru-Guia Al Dia Magazine renewed a five-year agreement to increase awareness of construction-related hazards, with an emphasis on outreach to Latino workers and other hard-to-reach groups. OSHA has announced a delay in the effective date of the Occupational Exposure to Beryllium rule, from March 21 to May 20, to allow for further review and consideration. The extension is in keeping with a Jan. 20 White House memorandum that directed the review of any new or pending regulations. This does not affect the compliance dates of the beryllium rule. For more information, see the news release. More than 1,000 people attended Pacific Coast Safety Fest conferences held March 6-10 in San Diego, Los Angeles, Phoenix, Las Vegas, Honolulu, and the San Francisco Bay area. The events offered training classes to employers and workers on topics including OSHA's cooperative programs and on-site consultations, fall prevention, health hazards, confined spaces, and evacuation and emergency planning. OSHA has ordered Wells Fargo Bank N.A. to compensate and immediately reinstate a former bank manager who lost his job after reporting suspected fraudulent behavior. The manager, who had previously received positive job performance appraisals, was abruptly dismissed from his position at a Wells Fargo branch in the Los Angeles area after he reported incidents of suspected bank, mail and wire fraud. An OSHA investigation concluded that the former manager's whistleblower activity, which is protected under the Sarbanes-Oxley Act, was a factor in his termination. In addition to reinstating the employee and clearing his personnel file, Wells Fargo has been ordered to fully compensate him for lost earnings during his time out of the banking industry. See the news release for more information. 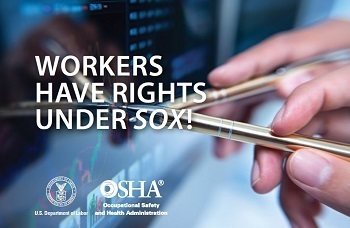 OSHA enforces the whistleblower protection provisions of Sarbanes-Oxley and 21 other statutes protecting workers who report violations of laws in various industries. OSHA initiated an inspection of Orion Industries Ltd. in response to two employee complaints of exposure to air contaminants at its Chicago facility. The inspection identified workers in the spray painting operation being exposed to hexavalent chromium at levels approximately 40 times the permissible exposure limit. Inspectors cited the company for lacking sufficient engineering controls, work practices and protective gear to safeguard workers against exposure to hexavalent chromium. Orion has been prompt in addressing the worker overexposures since being informed about them and achieved significant reductions by the time of its closing conference with OSHA inspectors. The Alaska Occupational Safety and Health Division has cited Universal Energy, Price Gregory International Inc. and Quanta Power Generation Inc. for multiple safety violations on a construction project in Anchorage, Alaska. An inspection at the Municipal Light and Power plant found that a pressure relief valve had been removed from a steam piping system and that system was put into operation without other safeguards in place. 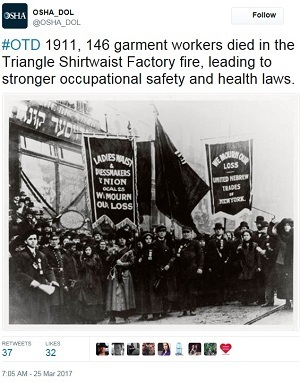 Two days later, the pressure reached dangerous levels, causing violent shaking of the piping system and leading to the evacuation of employees. Read the news release for more information. Johanna Beverage Company in Spokane was cited for four workplace safety violations by the Washington Division of Occupational Safety and Health after exposing workers to ammonia from three separate chemical leaks. Inspectors found that the company failed to: develop a written emergency response plan in the event of an ammonia leak; provide workers with emergency response training; and provide an ammonia alarm system to alert workers when they need to evacuate. For more information, read the news release. OSHA has released three guidance documents to help employers comply with the agency's Process Safety Management standard. PSM is critically important to facilities that store highly hazardous chemicals. Implementing the required safety programs helps prevent fires, explosions, large chemical spills, toxic gas releases, runaway chemical reactions, and other major incidents. The new documents focus on PSM compliance for Small Businesses, Storage Facilities and Explosives and Pyrotechnics Manufacturing. Recordings of two recent training seminars are available to watch online. 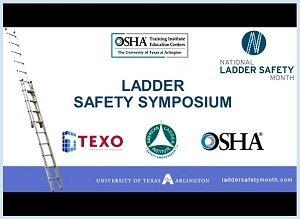 One is a symposium on ladder safety hosted by the OSHA Education Center at the University of Texas, Arlington. The other is a webinar on "Communicating with Workers about Hazardous Materials" hosted by the American Staffing Association as part of its alliance with OSHA.